This special chase figure is part of the Ultimate Galactic Hunt promotion: a series of 10 variant figures. 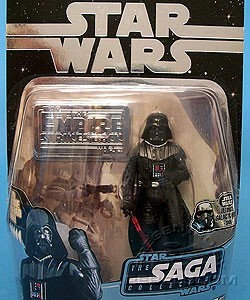 It is the same exact figure as Darth Vader SAGA-013, but the packaging has silver foil on it. The base is also silver with black lettering, and the exclusive hologram figure is silver with a black wash...making it look pewter.